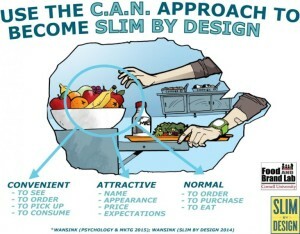 Findings from a study conducted by the Cornell Food and Brand lab emphasize the importance of external cues in eating behavior, and propose three secrets to healthier eating: make the healthiest choice more convenient, more attractive, and more normal! The researchers analyzed 112 studies that had looked at healthy eating behaviors, and found that some important factors that distinguished healthy and unhealthy eaters were whether they were exposed to restaurants, school cafeterias, or grocery stores that made fruits and vegetables visible and easy to reach (convenient), appealingly displayed (attractive), and appear like an obvious choice (normal). 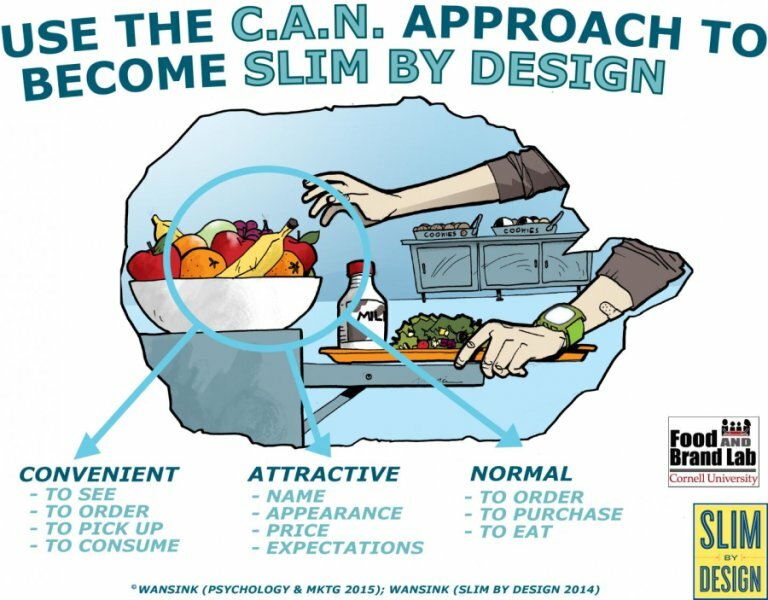 “A healthy diet can be as easy as making the healthiest choice the most convenient, attractive, and normal,” said Brian Wansink, Ph.D., author of the book Slim by Design, and the director of the Cornell Food and Brand Lab where this study was conducted. An earlier study conducted by Dr. Wansink, which aimed at increasing white milk consumption and decreasing chocolate milk consumption in schools, also found similar results. In this study, the researchers tried to change the children’s choices by putting the white milk at the front of the cooler (making it more convenient), selling it in a shapely bottle (making it more attractive), and giving it a greater proportion of the cooler space (increasing the normalcy). After these interventions, the white milk consumption increased by 30-60% in schools! “With these three principles, there are endless changes that can be made to lead people — including ourselves — to eat healthier,” Dr. Wansink said. Read more about the study here!